Tamarack's twin missions are to rehabilitate injured, sick and orphaned wildlife in order return them to the wild, and to provide education for all ages promoting appreciation and understanding of wildlife. 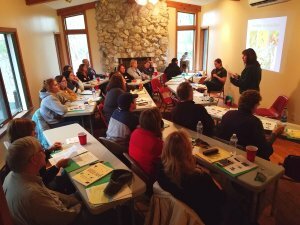 Founded as a rehabilitation center by Harriet Wilson, a Licensed Wildlife Rehabilitator (LWR) in 1989, Tamarack Wildlife Center was originally located at Harriet’s home on Tamarack Lake. In 1992 Sue DeArment became the second LWR for the center and a site was rented for the center at Sue’s home on Stull Road on the outskirts of Saegertown in Crawford County, Pennsylvania. Under Sue’s charismatic direction, education was added as a second mission for the center. Lady Hawk, a magnificent Red-tailed Hawk, was our first ambassador raptor. Carol Holmgren came to the center in 2006 and is the third and current principle LWR for the Center, a role she took on when Sue retired in 2013. Dedicated volunteer, Gina Kron, became a LWR in 2016 and now specializes in the treatment of songbirds and other non-raptor avian species at her Songbird Healing Center in North East, under the umbrella of Tamarack Wildlife Center. In 2016, with the help of a dynamic board of directors and donors, the center purchased it’s Saegertown location, securing a permanent home for the center. The board has a vision to make renovations to the physical buildings and increase staffing in order to improve the service provided to wildlife and our community, while ensuring the future of Tamarack. Initially, Tamarack treated every type of injured wildlife except deer and bear, but the numbers requiring assistance soon became overwhelming. The Center now specializes in treating birds of prey of all ages, and other species of wildlife are cared for whenever there is the staffing, room and funding to do so responsibly. With the addition of a Wildlife Rehabilitation Manager in 2018, admission of mammals has been expanded. Phone the center for current information about what species can be admitted. Note: our center is not licensed to admit. rabies vector species such as raccoons, fox, skunks, bats, coyote and woodchucks, but can give advice about most wildlife issues. The admission routine for injured animals is very like that seen in a human Emergency Room setting. Upon arrival at the center, information is taken from the finder and the wild animal is evaluated in the admission room and initial care is given. The initial care involves a medical examination, drawing blood for testing (if needed), cleaning and dressing wounds, splinting any possible fractures, treating for parasites, and administration of any needed medications or fluids. In species prone to lead toxicity, such as Bald Eagles, Loons, Turkey Vultures and others, a blood lead test is run onsite. The patient is then settled in our Intensive Care Unit, or “I.C.U,” an indoor room where patients needing intensive care are housed. It is common for patients to remain in I.C.U. for several weeks as their fractures heal or they recover from illness. If appropriate, physical therapy is given to improve range of motion and promote full recovery. Once ready to begin self-exercise, the wildlife patient is moved to one of several outdoor enclosures that is protected from the elements and potential predators and an appropriate size for the species. This setting affords the patient the opportunity to adjust to the outside environment and gain stamina while still being regularly fed and treated by Tamarack's team. Our largest avian patients, Bald Eagles, receive flight conditioning in our 104 foot flight building. Before release each patient is evaluated to ensure that it has the ability to survive on their own. Tamarack has an impressive release rate. Of the admissions that survive the first 24 hours, typically over 70% are released. Our greatest success is seeing a wild animal returned to its home. With birds, this can be quite dramatic and breathtaking as they return to the open sky. 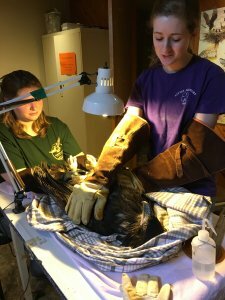 The Tamarack team has particular expertise in treating Bald Eagles and they are being admitted in record numbers. In the founding years, a Bald Eagle was treated once every few years. Since 2007 however, with the rebound of Bald Eagle populations in the area, that number has risen to 10-15 eagles treated per year. This is among the most treated at any rehabilitation facility in Pennsylvania. On occasion the injuries sustained by wildlife, cause them permanent disability and they can't be returned to the wild. These patients are evaluated for both health and temperament. The Tamarack team members then work to place good candidates in an appropriate licensed setting. Some can act as foster parents for orphaned young at a rehabilitation center. Others become ambassadors for their species and are placed with Zoos or Nature Centers. Often a young Red-tailed Hawk or Screech Owl takes to glove training and shines as the star of an education program. Live wildlife captivate and inspire us. Tamarack provides educational programming throughout our region. In the presentations non-releasable live birds of prey and an ambassador opossum serve as models of physical and behavioral adaptations, natural selection and human impact on species survival. An amazing cast of non-releasable wildlife assist in this goal: Jasper, a petite Eastern Screech Owl, Lady Hawk, a powerful Red-Tailed Hawk, Apollo, a sleek Peregrine Falcon, and Prudence, an inquisitive, gentle Opossum, among others. During programs, an owl, hawk or falcon perches on a handler's glove, or the opossum is presented on a table. Take the opportunity to see these magnificent wild creatures up close. The encounter is awe inspiring.